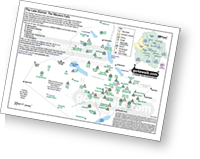 Downloadable Peak Baggers Map you can Print or Save to your Phone detailing all the Wainwrights, Mountains, Hewitts, Nuttalls, Deweys, Waiinwright Outlying Fells, Marilyns, Bridgets, Hills, Peaks and Tops in The Western Fells of The Lake District National Park. 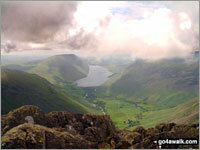 The Western Fells area of The Lake District National Park is enclosed by the edge of The Lake District National Park from Egremont to Cockermouth to the North West, Lorton Vale, Crummock Water, Buttermere and Honister Pass to the North East, Sty Head Pass and Wasdale to the South East and an imaginary line from the Southern Tip of Wast Water to Egremont to the South West. Downloadable Peak Baggers Map and Tick List# you can Print or Save to your Phone detailing all the Wainwrights, Mountains, Hewitts, Deweys, Nuttalls, Wainwright Outlying Fells, Marilyns, Bridgets, Hills, Peaks and Tops in the The Western Fells of The Lake District National Park. *Special Wainwright Baggers' version# of the above Peak Bagging Map and Tick List you can Download and Print or Save to your Phone that shows the walk routes you should follow to climb, bag and conquer all 33 Wainwrights in The Western Fells of The Lake District National Park in just 10 walks. NB: Whether you print off a copy on to paper or download it to your phone, this Peak Baggers Map and Tick List will prove incredibly useful when your are up there on the tops and you cannot get a phone signal!